Holly Pipe Corporation can fulfill any customer specification for new or premium used drilling tubulars such as drill pipe, (2 7/8” OD – 7 5/8” OD by 15’, 20’, 31’ lengths), heavy weight drill pipe (HWDP) and pipe casing. Drillers working in the oil and gas, utility, geothermal, water well, horizontal directional drilling (HDD), and trenchless underground construction industries rely on Holly Pipe for dependable drill pipe and manufacturing services When drillers are required to maintain a drill string and reduce downtime in the field, Holly Pipe's experienced and knowledgeable sales team can help you choose the right drilling tools and equipment for your needs. NST drill pipe was designed by drillers, for drillers to overcome multiple horizontal and directional drilling problems. 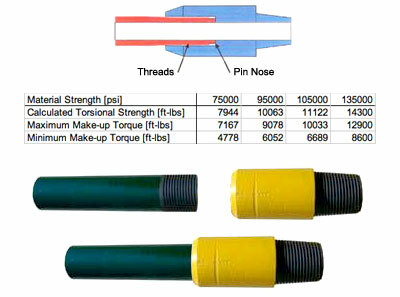 The NST (Nugent Special Thread) design gives the driller the ability to use many unique and non-conventional bits and tools of special sizes through the tool joint, allowing greater fluid and larger bit size. It also develops 50% greater torque and compression than standard API tool joints of equal grade, size and dimension. NST tool joints experience less restriction when sliding and extracting the drill string with the use of the FJ (flush joint) and IU (internal upset) Series drill pipe sizes. This is accomplished by the NST thread design with flush O.D. box and pin. Used drill pipe rendered unsuitable for drilling can be refurbished to extend its workable life by rethreading NST onto the pre-existing API box or pin. By refurbishing drill pipe our customers effectively double the usable life of their drill string. 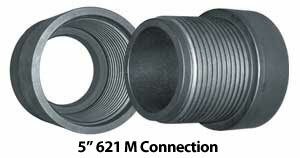 For example: The 5” NST 621 M connection is commonly used on 5" 25.60# with worn down or thin tool joints as long as the tubes are still good. For technical data of torque and tensile values of NST drill pipe click here. 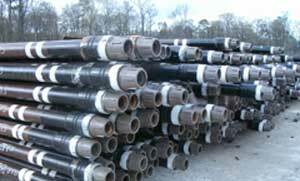 Holly Pipe provides drill pipe rental to drillers in the United States and internationally. Our rental drill pipe is kept in pristine order and ready to go at a moment’s notice. Upon return the rental drill pipe is thoroughly cleaned, inspected and tested for quality in compliance with API standards. Contact us to reserve your drilling tools today! Holly Pipe understands how hard it can be to find dependable drill pipe to buy or rent at a reasonable price. We can provide API drill pipe with standard connections or the modified NST drill pipe for special projects. We are dedicated to meeting your needs not only with the drilling tubulars required, but also with the knowledge about its integrity. When using expendable equipment, it is best to turn to someone who knows the business of drilling. When the job requires special tools, you can count on Holly Pipe. 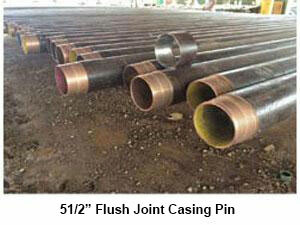 We provide flush joint drill pipe in extreme cases where the bore runs uphill or is constricted with tight cobble. 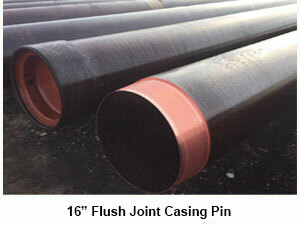 The flush joint is manufactured by inertia welding tool joints on internal upset 6 5/8” tubes. The DS-50 connection combined with the classic 6 5/8” tube provides a streamline drill string that can withstand uncommon compression and tensile strength requirements. 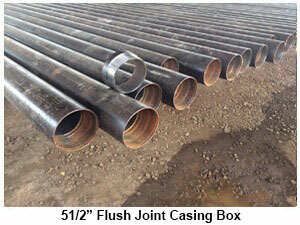 Over the past two decades in the HDD industry, the use of wash pipe for “surface casing” has become more and more popular. In order to prevent hydro-fractures, stabilize the pilot bore, prevent cave in, and create a suitable “backstop” for pushing, wash pipe links hand in hand with the common HDD tools for drilling. Traditional wash pipe is typically welded together and “washed over” the existing pilot string which can take 1-3 days to complete if welding is required. NST’s “Drill and Drive” wash pipe will render traditional methods useless while cutting fabrication time. 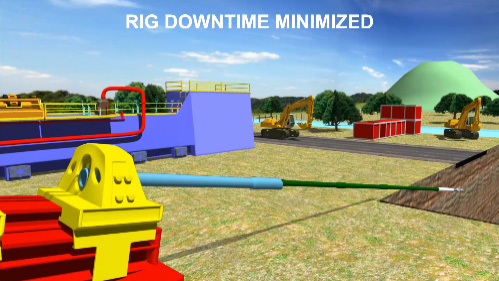 Eliminating rig downtime and allowing drillers to push farther is how “Drill and Drive” will revolutionize the initial set up and completion of pilot holes and beyond. 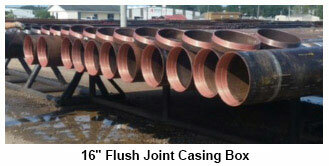 NST can supply 31’ ft or 43’ ft casing in the sizes below (approx. sizes) ready for service in a matter of a few days. 5" O.D. x 4 1/4" I.D. 5 1/2" O.D. x 4 5/8" I.D. 6 5/8" O.D. x 4 3/4" I.D. 7" O.D. x 5 7/8" I.D. 8 5/8" O.D. x 7 1/2" I.D. 10 3/4" O.D. x 9 1/2" I.D. 11 3/4" O.D. x 10 3/4" I.D. 13 3/8" O.D. x 12 1/8" I.D. 16" O.D. x 15" I.D. 18” OD x 17” I.D. 21” OD x 19” I.D. Holly Pipe and NST can mass produce a variety of common drilling tools, but if you have an idea for a single custom tool or prototype, we can assist you with design and manufacturing. Let us know how the tool will be used, provide us with a sketch and you can be reassured the tool will meet your requirements. For example: Water well drill pipe is commonly manufactured by shortening 31’ to 20’ pipe and milling wrench flats on the box end. Our 3 ½” 15.50# print shows the in-house pin connection for water well drillers. Visit our machine shop for more information.